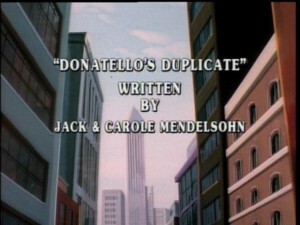 Donatello decides to create a clone of himself so that he can spend more time on his inventions while his clone spends more time fixing things around the Lair. Donny tests his latest invention on a sewer rat and accidentally gets his hand in the way, causing the rat clone to talk just like Donatello. The talking rat is discovered by The Rat King and is convinced by a local hood, Pinky McFingers, that they could take over the world with Donatello’s invention. Meanwhile, Donatello turns his cloning machine on himself and, thanks to an algebraic miscalculation, creates a clone that is 10 times smarter than he is. The Clone refuses to do the work that Donatello specifically created it for. Donatello decides to put him in his place until he discovers that his Clone is also 10 times more adept in ninja skills. The Clone defeats Donatello, ties him up, locks him in a closet, and then finds himself abducted by Pinky McFingers (who double-crosses The Rat King) when he goes out for a walk. The Clone convinces McFingers that he is not Donatello and builds a cloning device that replicates thousands of rats, causing The City to be infested with them. While the City is in a panic, McFingers and his crew loot the shops. Donatello is found by the three other Turtles and he tells them of his Clone. As they begin their search, the TMNT encounter the Rat King who is more than happy to help them find the Clone. The Rat King gives our heroes Pinky McFingers’ address. At McFinger’s Mansion, Donatello’s Clone creates clones of Michaelangelo, Raphael and Leonardo. Donatello tricks his Clone into revealing the cloning process. When he does, all Turtle clones, including Donatello’s and the rat’s disappear. Wacky.